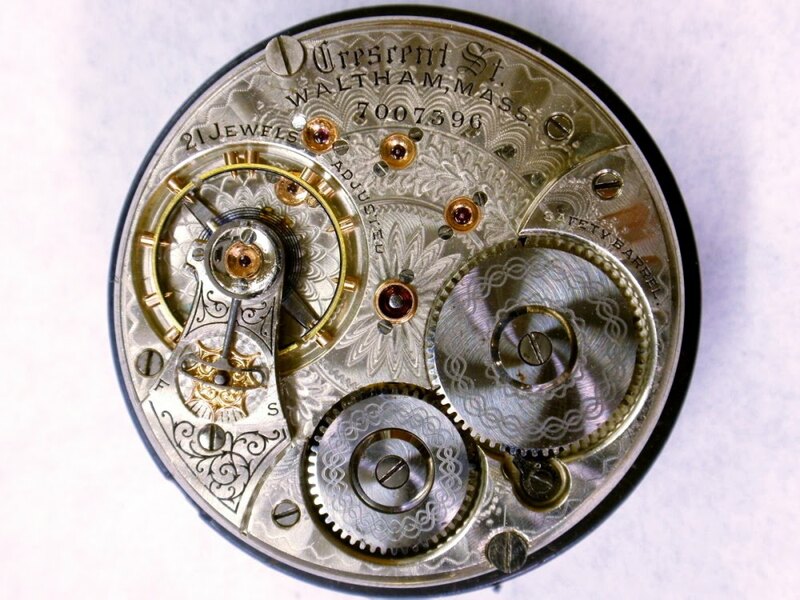 In 1894, in the midst of fierce competition and trying financial times, Waltham introduces the Vanguard movement, which becomes known as the Model 1892. The first five runs of the Model 92 are marked “Vanguard”. The sixth and seventh runs (7005001-6000, 7006001-7000) consist of the Appleton Tracy & Company grade and some Riverside movements. The eighth run (7007001-8000) marks the introduction of the Crescent Street grade. 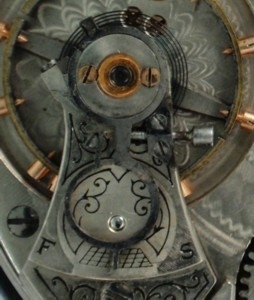 The movement below, 7007396, is a first run Model 92 Crescent. The Waltham Watch Company was located on Crescent Street in Waltham, Massachusetts next to the Charles River. Although not in use at this time, the building still stands and is an interesting place to visit. Across the river is a cemetery where several of the gifted mechanics who worked their magic at Waltham are laid to rest. Waltham used the name Crescent Street as a grade name on several different models. It was first used on the Model 1870 and that movement has the distinction of being the first advertised as a “Railroad” Watch. Waltham uses the name again on the Model 1883 and will use it from the 8th run of Model 92 movements almost to the very end of Model 92 production. 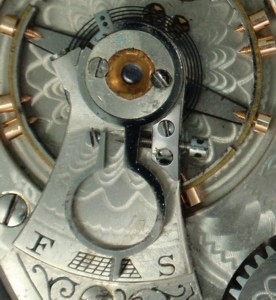 When used on the Model 92, it indicates a grade second to the Vanguard grade. 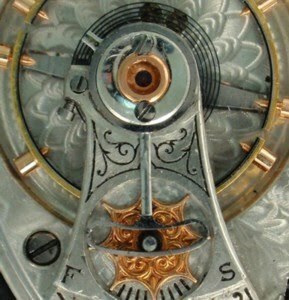 In the Model 92 it is found in 17, 19 and 21 jewel movements as well as two-tone movements. There is known to be one 23 jewel Crescent Street but it is fairly certain that it was not a part of regular production. 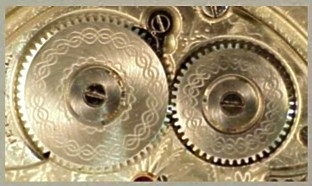 Besides the movement variations that occur in all grades of the Model 92, the Crescent Street has some special variations, some of which are very “rare” and two variations that are quite unique. The first Model 92s made with the serial number next to the barrel bridge (Serial Number Position 2; SNP2) are 21 Jewel Crescent Streets. Many of the 21 Jewel private label movements that Waltham made were made from Crescent Streets. I have to admit a bias towards the Crescent Street-it was the first Model 92 I ever saw. The Crescent Street story is a bit more straightforward than the Vanguard story. There are mixed jewel runs but they are more clearly grouped than in the mixed runs of the Vanguard grade and are for the most part combinations of 19 and 21 jewel movements. In a few instances, the Gray Book lists 17-21 jewel Crescent Streets. In all but one run, the 17 Jewel movements are two tone and have been adapted from the Royal grade. It would also appear that Waltham did not “plug” Crescent Streets and alter the jewel count on existing movements as it did with Vanguards. Although there are runs of Model 92s with mixed grades, only two are listed in the Gray Book. The first, 9544701-9544900 is listed as being 17-19 jewel Crescent St. and Appleton Tracy & Co. movements. To date only 17 Jewel Private Label movements have been reported from this run. The second, 16079701-16081000 is listed as Crescent St. and No. 845 movements. Crescent Streets and 845s have been reported from this run. Because it was made from the beginning almost to the end of Model 92 production, we will begin with the 21 jewel Crescent Street and then be able to reference the photos of these movements when examining the other jewel counts. It occurs in all 8 movement variations, the eighth being the addition of a groove on the outer edge of the movement next to the balance wheel. The Groove begins to appear on Model 92s in the 16 millions. Two runs of 21 Jewel Crescent Streets contain some movements with the groove. The last run of 21 Jewel Crescent Streets listed in the Gray Book is 20036001-500 but to date, no movements have been reported from this run. The two-tone 21 Jewel Crescent Streets will be treated separately. The photos below show the three Regulators found on the Model 92 Crescent Street. This is the damascening pattern found on all Crescent Streets. It is also found on the 845 grade.